Are visitors to your blog really engaged in your content? How much of what you write do they read? Is your ‘bounce’ rate an accurate reflection of how engaging your blog is? It’s important to understand how to use Google Analytics and your engagement statistics so that you can understand what your visitors are doing, and work to improve your blog. In this article, we outline some metrics you should consider monitoring to understand how engaging your blog is. If people really like the content of your blog they may subscribe to get your content via RSS (they use an application to read content from a variety of blogs) or they may subscribe via e-mail. However, it’s likely that this is only a very small percentage of your blog traffic. What about other visitors to your blog that just like coming back on a regular basis to get your content. Your visitor traffic comes from a variety of sources and one source is just people remembering your blog and coming back. In the audience section of Google Analytics under ‘Frequency and Recency’ you can see how many people come to your website once, twice etc over a period. In the example below 71% of people only visit the site once. This is something that is worth monitoring on a monthly basis to see if this figure gets better as you continue to develop the content. 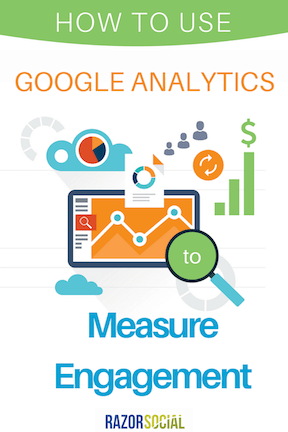 During your process of learning how to use Google Analytics you will find a section that measures engagement. In this it shows how long visitors stayed on your site. Beware: When somebody only visits one page Google puts them in the 0 to 10 second category irrespective of how long they spend on your page. The reason is that Google measures engagement when a visitor moves between pages! With a blog a lot of people will only view one page so the 0 to 10 second section will generally be high. Make sure you look at these stats alongside the other metrics we mention, to make sure you get a clear overview of what your readers are doing. Average Pages per visit: How many pages do your visitors go to? As mentioned above, a blog may have a low number. There are ways to try to encourage your visitors to visit other pages, for example, providing related posts at the end of a post. The more pages your visitors go to during a session, the more engaged they might be. It means they are following your internal links and exploring more of your site. If you can increase the number of pages your average visitor clicks to, this suggests you are improving how engaging your website is. Time on site: You want to monitor how much time visitors are spending on your site. If the average number of pages is low but time on site is high and it’s a blog then this may be because they are reading your post and then leaving! You can also compare how different blog posts are performing… are some posts keeping people on the page for several minutes, while others lose readers after a few seconds? Take a look at each post, side by side, and try to work out what makes the difference. Including videos, great internal linking and compelling calls to action can all help. For an in-depth look at bounce rates in Google Analytics, check out our bounce rate reference guide. If you try to build eMail subscribers a good way of measuring engagement is your email subscription rate. If visitors are really engaged and like your blog they will subscribe. You might also want to measure how many visits to your site come from your email list subscribers. These metrics can show whether these visitors are more engaged because of your email marketing. In this video, Christopher Penn looks at how to isolate your email traffic within Google Analytics and then look at your subscribers’ behavior on your website. Are they more engaged than search engine visitors? More engaged than PPC referrals? If you look at traffic -> all sources you can see the average pages per visit and time per visit broken down by channel. This shows you what is working/not working. If you understand where your engagement is coming from, you can concentrate your efforts to make sure you get the best results. On our stats it shows that the lowest bounce rate and most number of pages visited is Google Plus visitors followed by visitors from links to our site on Social Media Examiner. Both of these are working for us so worth spending more time on them. There are many ways to measure engagement in Google Analytics, select the most appropriate for your business and track on a weekly basis! What analytics do you use to measure engagement? Are you going to drill down deeper into the stats after reading this post?